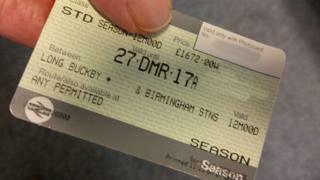 Rail fares: Who are the season ticket winners and losers? Commuters in some parts of England will be worse off than others from rail fare rises, which were called a "kick in the teeth" by critics. In some areas there was no increase in annual season ticket prices, despite wage growth. Others have seen their annual fares rise despite average pay having fallen. Across the UK rail fares of all types - from season tickets to single journeys - increased by an average of 2.3% on the first weekday of the new year. Analysis by the BBC England Data Unit found annual season tickets had increased in cost by 1.9%, while median take-home pay had increased by 2%. The government said wages were growing faster than regulated fares, which include season tickets. Passengers commuting to Manchester with the most popular annual season tickets saw no increase at all, while the median take-home wage increased 2.8%. Annual passes from East Didsbury, Macclesfield, Stockport, Altrincham, Wilmslow, Rochdale, Ashton-under-Lyne, Bolton, Glossop and Knutsford are all the same price as they were before the increase. Yet commuters in Liverpool will pay 1.9% more for an annual pass. This is despite median wages having fallen, according to the Office for National Statistics. For more stories from the BBC England Data Unit follow our Pinterest board. Someone travelling from Runcorn to Liverpool would pay £1,532 for their annual pass, £28 more than in 2016. In Liverpool the average full-time wage, after tax and National Insurance deductions, fell from £21,901 in 2015 to £21,634 in 2016. The most expensive annual season ticket per mile travelled is Harlow Town to London Liverpool Street. A commuter pays £3,496, which is £64 more than in 2016. It works out at 39p per mile travelled. The figures are based on a Campaign for Better Transport (CBT) list of the most commonly used commuter services in six major cities. Our analysis of the figures was based on full-time workers using an annual season ticket five days a week, except on bank holidays or on 25 days of annual leave. Lianna Etkind, public transport campaigner at the CBT, said: "Wages remain stagnant and trains continue to be hopelessly overcrowded, so commuters are rightly angry at annual fare rises when they see little or no improvement in the service they receive. "Many commuters are now being charged at a similar level to a premium rate phone number for their season tickets and are left feeling equally as fleeced. "It's high time the government introduced a fairer ticketing system that actively encouraged rail travel, not penalised people for choosing to take the train." According to the Rail Delivery Group (RDG), which represents train operators, about 97p in every pound paid by passengers goes back into running and improving services. RDG chief executive Paul Plummer said: "Money from fares is helping to sustain investment in the longer, newer trains and more punctual journeys that passengers want." The Department for Transport said it had saved commuters money by capping season ticket increases so they are in line with inflation. Transport Secretary Chris Grayling said: "Thanks to action by the government on train ticket prices, wages are growing faster than regulated fares." Northern Rail, which runs commuter services into Manchester, confirmed it had not increased annual season ticket fares but said other prices had risen. It declined to comment further.